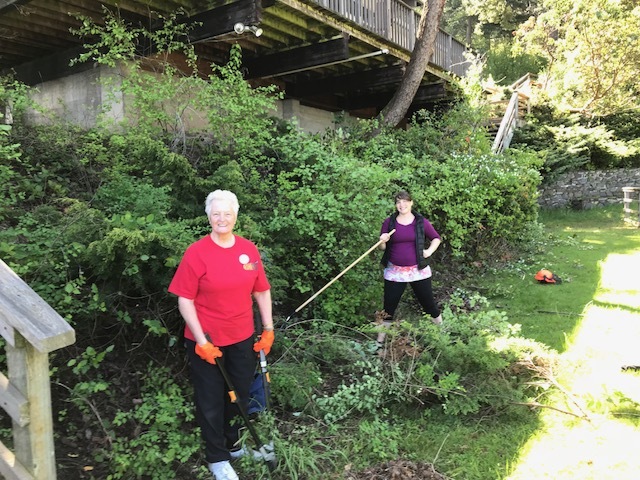 A volunteer work party gathered at the Clubhouse and Marina for Wildfire Community Preparedness Day on May 5, 2018. We cleared and chipped limbs, and cleared vegetation under the Clubhouse deck. Thank you to our volunteers: Jason Brubaker, Dave Kertis, Jeff Smith, Regina & Ben Twigg, Jon & Marie Van den Driesen, and Barry Watson! The project was coordinated by our Firewise Coordinator Frankie Small and Isaac Colgan. A $500 grant from the National Fire Protection Associations (NFPA) funded a chipper and dump truck supplied by Chris Immer. Mark Sexton volunteered a dump trailer as well. 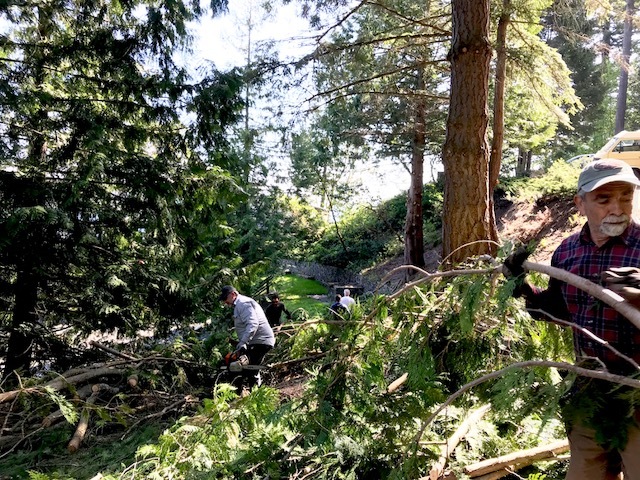 About nine cubic yards of trimmings and chipped tree limbs was delivered to Aiston Preserve as part of the Lummi Island Heritage Trust reclamation of a former quarry. Learn more about Firewise here! Why is wildfire such a concern? The Clubhouse and Marina beach are surrounded by trees reaching up the hill, so the vegetation needs to be brought under control. Removing low hanging limbs and tall underbrush minimizes the likelihood of flames or surface fire spreading uphill.